I come from a non-tattooing family and have a fairly low threshold for pain which is probably why my skin is devoid of art. However I’ve always found tattoos fascinating. From the art of the design, to the skill of the tattoo artist to translate that to the skin, using shadow and colour. I’m interested in what the tattoo means to the person, how they chose it and how it reflects their personality. Why am I suddenly blogging about tattoos? I’d had a busy day at work and stopped for a break to catch up on social media and discovered I wasn’t the only busy one. 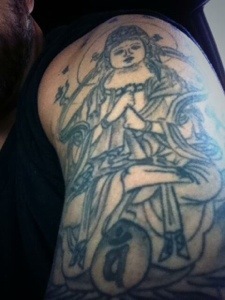 Our favourite stuntman had spent many hours in the chair under the tattoo gun of Lino from Dharma Studios. His work is spectacular as you can see below. 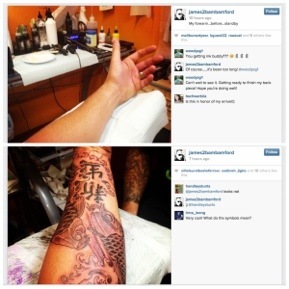 James shared the progression of the tattoo via Instagram and Twitter from bare forearm to completion. The design appears to be two fish, the symbol for Pisces and some characters that I haven’t quite figured out yet. It looks incredible!! It isn’t the first tattoo for James. He has tattoos on his upper arm, calf and hip if I’m not mistaken. I’m sure this won’t be the last either. Hopefully James isn’t in too much pain and we thank him for sharing the photos with us. Updated article with corrections to the tattoo facility. Apologies. James has posted a Vine video of the tattoo… So impressive. Also, check James’ Instagram account for photos of Stage 2 of the artwork. It’s a private account so you’ll need to follow – james2bambamford.